For a little over a week now, my focus on the 2014 Walt Disney World Marathon has been coming into more focus. A friend of mine posted this link to a blog post entitled Identity-Based Habits: How to Actually Stick to Your Goals. In the article, this quote is what got me thinking more about the mental aspects of training for a marathon. Hmmm. I need to start believing new things about myself in order to see lasting change. Since finishing the Tinker Bell Half Marathon, I’ve been working towards a new identity…Runner…In completing the training cycle for the Disneyland Half Marathon, I finally started seeing myself as that. However, this new identity comes with another…Athlete…Setting a time goal in the Rock n Roll Los Angeles Half Marathon and beating that goal is moving me in that direction. 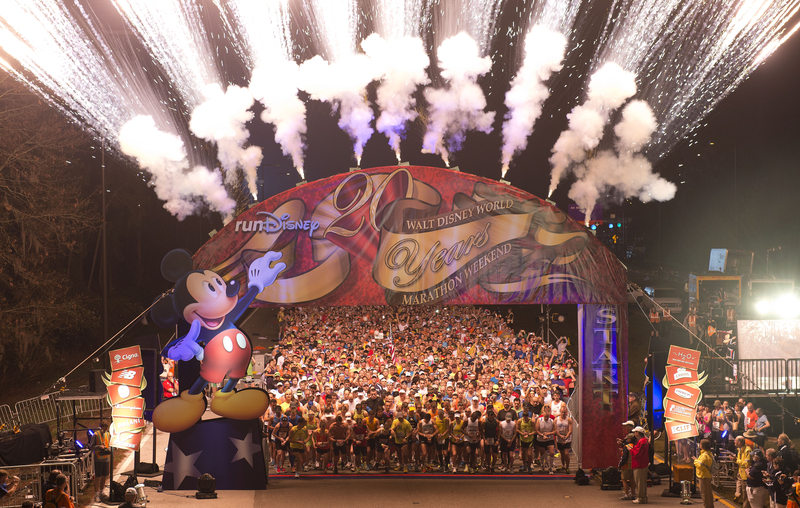 In training for the Walt Disney World Marathon, I’m seeking another identity…Marathoner. I’ve noticed, and noted in another blog post, how my perception of distance has influenced my ability to continue running. Back then, it was pushing past the 8, 9, or 10 mile barrier. I was struggling with keeping focused beyond 10 miles and found myself on the long runs abandoning my run to walk ratios at that point and having to deal with the thoughts of wanting to be done already, of feeling tired, etc. Even at the Rock n Roll Los Angeles Half Marathon, I had some moments of doubt. So, there must be more to dealing with long distance running than the physical. This week I started looking for help with the mental training. I thought that this video was interesting. Ryan Hall, US record holder at the Boston Marathon talks about visualization and trying to think through all the aspects of the marathon race he’s participating in months in advance. I’ve heard that the 2014 Walt Disney World Marathon course will be similar to the course from 2013 (which was a new course). Now, I don’t live in Orlando. So, I can’t go out and travel the course like I did with the Disneyland Half Marathon. However, as Ryan suggests, I can go to Youtube and see videos of the race course. This video is the one runDisney and Runner’s World put together with Bart Yasso. It’s a good first step in visualizing what I’m in for this coming January. I liked the computer graphics and that there are scenes of Bart in the actual places where you’ll be going through. However, the weakness of this video is that it glosses over parts of the course. Even in the attempt of following the course, I noticed that, especially in the part of the course that goes through the ESPN Wide World of Sports Complex, parts of the course even get cut off from the computer graphic. I did like that Bart describes parts of the course. Like, I know where the overpasses are and that the climbs aren’t that bad or very long. That’s good to know. Lee’s video does an even better job at giving visuals of the race course. In a 12 minute video, it can’t cover it all. However, I really appreciate how much of the course he does display. I also appreciate that how still the images are. As you can see, Adam’s video isn’t as still. However, it gives a little more of the course because the video is longer. As I’ve looked over various videos from on the course, I’ve learned that the longer ones tend to have a lot of bouncing around. If you watch enough of those videos, it might make you naucious. Between the three videos, I think it gives me enough to visualize the course. Over the next couple months, I am planning on coming back to these videos often. What do you do in mental preparation for your long distance races?